The folks at Native Unity share their grave concerns about the use of weapons grade uranium at the Atomic Energy of Canada Limited (AECL) facility at Chalk River, Ontario, citing a noted Canadian no nukes activist. Gordon Edwards, of the Canadian Coalition for Nuclear Responsibility, raised serious concerns about the “Maple” reactor delays at Chalk River. “An important aspect of the isotope-production fiasco on Algonquin territory is being ignored. AECL Atomic Energy of Canada Limited uses 95 per cent highly enriched “weapons-grade” uranium HEU to make the main isotope (Molybdenum-99). This can be made using low-enriched uranium LEU which is NOT weapons-usable material, but is more expensive. Somebody wants to make isotopes and bombs cheaply. He continued, “It’s easier to make a very powerful bomb with weapons-grade uranium like the one dropped on Hiroshima in 1945”. The only stockpile of weapons-grade uranium in Canada is at Chalk River, less than 200 kilometers up the Ottawa River from Canada’s capital. The Canadian public and Members of Parliament are told they are for “essential and life saving” medical isotope production. However, there’s enough there to build two or more atom bombs and the stockpile is increasing. Why is the Canadian company, MDS Nordion, that sells the isotopes, ordering more of the risky weapons grade uranium from the U.S.? Why do Canada and the U.S. allow this hazardous material to be transported over regular highways, rails and air? The U.S. warns the towns where these materials are being transported. Not in Canada ! Prime Minister Harper is considering the privatization of more of AECL. AREVA’s interest was known 18 months ago, just after Harper took office. And now it is apparent that a sponsor of the Olympic Games (coming to Canada in 2010), General Electric, has also expressed its interest. General Electric Co. might be a suitor if Canada decides to sell a stake in state-owned Atomic Energy of Canada Ltd., as Prime Minister Stephen Harper hinted this week, a company spokeswoman said. “If and when the federal government indicates it would like to change its model for AECL, we would be interested in talking,” said Kim Warburton, a spokeswoman for GE Canada, reiterating comments in September by General Electric Chief Executive Officer Jeffrey Immelt. Areva SA, one of the world’s biggest builders of nuclear power plants along with GE, may also be among the bidders if the government decided to sell, analysts said. Atomic Energy’s commercial reactor and nuclear services businesses alone may fetch more than C$1 billion ($1 billion), said Catharina Saponar, head of European utilities and energy equity research at Nomura International Plc in London. Why our governments and we, the world’s citizens, allow an unethical industry to kill the planet’s ecosystems and creatures so that corporate giants can rake in more profits is completely beyond me! 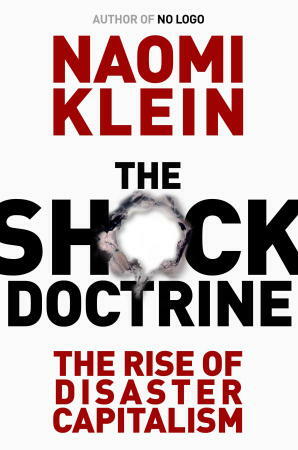 Naomi Klein’s film, The Shock Doctrine: The Rise of Disaster Capitalism, debuts today at the Toronto International Film Festival. It is shocking in its truth telling! Whew! Thank goodness it is short! As part of this blog burst, I will receive a review copy of Naomi’s book of the same title. Watch for that review in the coming weeks.